TEWKSBURY, MA -- The EHLP squad was back in action this past weekend, as they took care of business against the Connecticut Chiefs at home on Saturday, but fell against the New England Wolves on Sunday. After the weekend, the Premier team still sits in 1st place in the conference with a record of 20-3-2, and they are 4 points ahead of the 2nd place Wolves. On the other hand, the EHL squad won’t play again until Wednesday, when they are set to host the Walpole Express at Stoneham Arena. On Saturday, the EHLP squad welcomed the Chiefs to town for the first of six matchups against their divisional opponent this season. Mitch Gillespie got things started for the Rangers, as the forward found the back of the net around the 9-minute mark of the 1st period. Levi Hensley added to the lead with a goal near the end of the frame as the Rangers took a 2-0 lead into the intermission. Xander Wardlaw tucked away a short-handed opportunity around the 8-minute mark of the 2nd period to give the Rangers a commanding 3-0 lead. 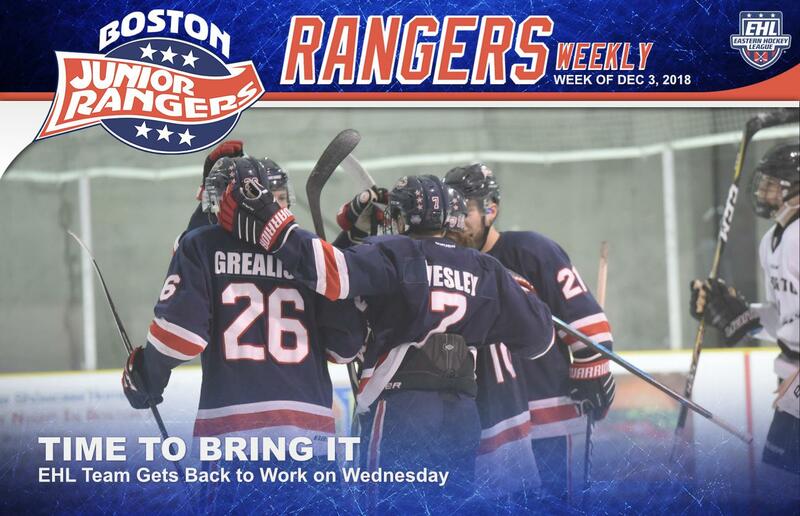 The Chiefs answered back with a goal in the 3rd frame, but that is all they could muster up as Gillespie added an empty-net goal in the final minute to lead the Rangers to a 4-1 win. Cam Libby stopped 16 shots in net as the netminder remains perfect on the season, stretching out his overall record to 7-0-0. On Sunday, the boys traveled up to Laconia for an important divisional matchup against the 2nd place New England Wolves. Going into Sunday’s game, the Rangers held a 2-1-1 record against their divisional rival this season with 3 more games to play. The Wolves got off to a hot start scoring a pair of goals in the first 5 minutes of the game and took a 2-0 lead. However, Hensley converted on the power-play near the end of the frame, followed by another Ranger’s goal from Nick Weaver to knot up the game at 2 goals apiece going into the break. The Wolves came out strong again in the 2nd frame, scoring 4 goals and carrying a 6-3 lead into the final period. The Wolves added to their lead in that 3rd period with 2 more goals and won the game by a final score of 8-4. Luke Marsh and Gillespie had the other Rangers tallies in the loss. The squad will get another crack at the Wolves on January 12th in New Hampshire. The EHL squad is set to return for an important month of December as the final few weeks of the calendar year includes 5 games against the Walpole Express, the Philadelphia Jr. Flyers (2), the Philadelphia Little Flyers, and the Philadelphia Revolution. On the other end, the EHLP squad will finish off the month of December with 3 more games within the upcoming week. The week will start with a matchup against the Valley Jr. Warriors on Thursday, followed by a trip to Philadelphia this upcoming weekend with games against both the Jr. Flyers and Little Flyers.